I welcome input concerning topics on this editorial page. Email me at theaccidentalconservationist@vcn.com. You might ask why I am focusing on what is being lost in Wyoming. What is being gained can pretty much be summed up as more people, more houses, more "stuff", all of which has be the goal of elected officials and apparently of real estate agents (after all, they sell houses and land for a living) since I moved here 27 years ago. As I have previously stated, the goal of Wyoming politicians is to turn the state into Northern Colorado. However, it is interesting to note that one of the most common reasons for moving to Wyoming and living here is open spaces. Our politicians legislate against people's reason for living here. Our leaders apparently have different goals than those who elect them. 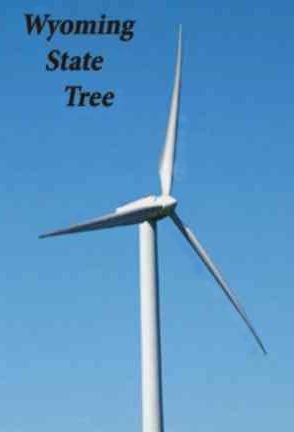 The current threat to the open spaces in Wyoming is wind energy. When Obama was running for president, there were several commercials run here against coal mining, showing the environmental damage and the noise involved. The clear implication was that coal is dirty and nasty. Reality check: Those wind turbines are LOUD. Plus they have a red light that blinks all night as a warning to air craft. From our place in Shirley Basin, you can see a line of red, blinking lights to the west of Elk Mountain. I refer to them as Christmas lights, and that is not a compliment. When the red lights go off at dawn, they are replaced by white blinking lights. I really was hoping our governor would point this out by filming a commercial standing under wind turbines that were rotating, but no such luck. Then there's the problem with birds. Besides the accidental killing of birds (which I am unsure of whether they are fined for this like power companies are. I would guess not.) there's a unique situation in Wyoming. Some believe the turbines will adversely affect sage grouse populations because sage grouse fear high things because raptors can perch on them and swoop down and attach the grouse. Whether or not there are raptors that do this may not matter. Animals work on instinct--centuries of it. And high perches mean danger to the grouse. Sadly, as long as wind energy is pushed by the current administration and there is money in the package, the turbines will continue to go up. 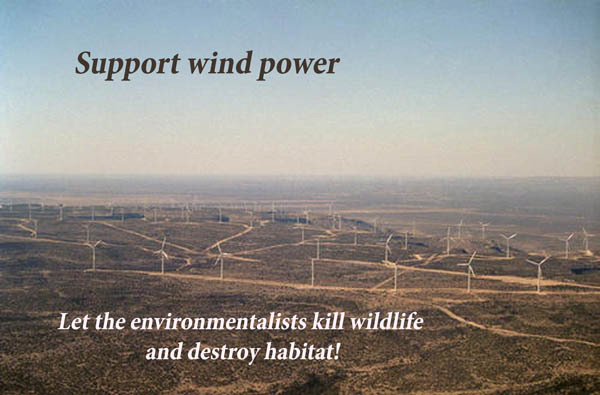 I do not oppose wind turbines only because of the environmental damage. Some damage will occur no matter what energy source we use. There is little evidence that the turbines produce even 25% of the electricity that is stated as the "projected" output. We are destroying thousands and thousands of acres of land and animal habitat for a technology that yields very little energy. In long run, I predict the cost to the environment and to taxpayers will far surpass anything coal and oil ever did. One of the problems with Wyoming is that we don't have a lot of trees or fuzzy critters. Everyone wants to save the forests and the polar bears, while the sagebrush sea and horned lizards aren't that important to most. Even environmentalists ignore the loss of the sagebrush sea and the associated animals. I think this is because saving the planet is more about getting money than actual saving. It's tough to get a fund going to save the horned lizard. Probably even difficult to rally behind the sage grouse. It's truly sad that saving the earth means trees and bears. There's lot more out there. Plus, I really am not sure how saving the trees and the polar bears leads to a better planet. It certainly wipes out diversity. Even the open spaces and wild west feel are interesting to tourists, but legislators want malls and subdivisions. This is so ingrained they will not correct laws that lead to unintended outcomes (35 acre subdivisions are the result of a law passed to help ranchers give their children a section of land without having to go through the subdivision process but is currently used to cut up ranch after ranch into subdivisions that have no services and destroy large areas of the prairie). They did make it possible for counties to require more honesty in selling the land, but counties are not required to do so. The sad thing is, most of the money for these developments goes out of state. I guess we want to be liked, even if we have to sell our soul to be liked.